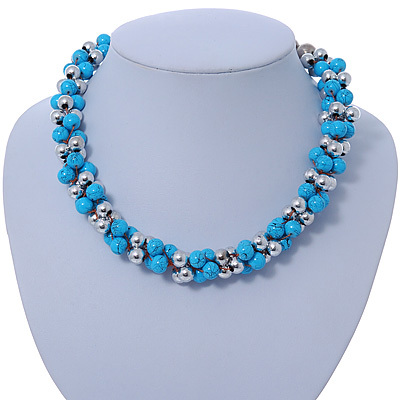 Adorn your neckline with this glamorous Light Blue & Silver Tone Acrylic Bead Cluster Choker Necklace. Featuring a beaded cluster design, made of light blue and silver tone acrylic beads set on the silk, orange thread. This bold necklace measures about 38cm in length with a 5cm extender. Fastens with a silver tone lobster claw clasp. Goes with everything from jeans to dressy numbers and looks sublime with suits! Also, check our store for a matching bracelet BR02335.